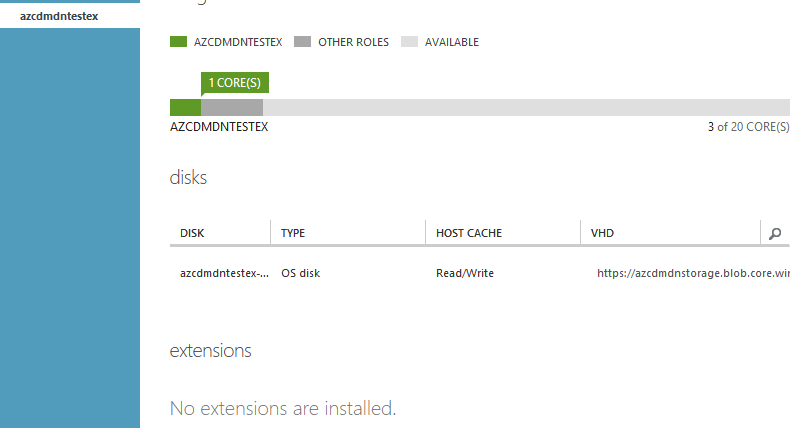 If you have a S2S VPN gateway connection between your on-premises and Microsoft Azure with a DNS server entry pointing to an on-premises DNS server you can experience the issue that the VM extensions are not installed. 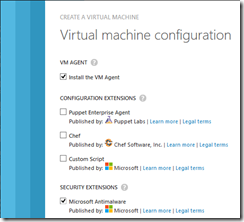 In the scenario you want to deploy a new VM in Azure, but the gateway connection between your on-premises and Microsoft Azure is not established, disconnected or otherwise interrupted. 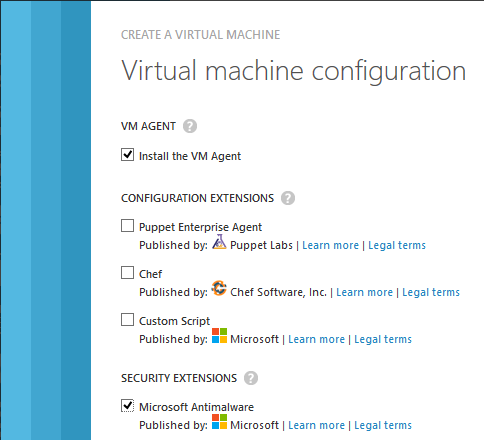 In the VM configuration wizard you will select to install the VM Agent and Microsoft Antimalware as the security extension. The deployment completes successfully. If you check the dashboard of the VM or login using a RDP session, you will discover that the VM extensions BGInfo and Microsoft Antimalware are not installed. To find out why the extensions are not installed check the WaAppAgent.log file under C:WindowsAzureLogs. You will find several errors and warnings like the following ones. [01/07/2015 18:31:04.37] [INFO] Downloading version manifest for plugin Microsoft.Compute.BGInfo from http://rdfepirv2am2prdstr02.blob.core.windows.net/bfd5c281a7dc4e4b84381eb0b47e3aaf/Microsoft.Compute_BGInfo_europewest_manifest.xml. [01/07/2015 18:31:16.39] [WARN] Error in downloading version manifest for Microsoft.Compute.BGInfo from: http://rdfepirv2am2prdstr02.blob.core.windows.net/bfd5c281a7dc4e4b84381eb0b47e3aaf/Microsoft.Compute_BGInfo_europewest_manifest.xml with exception: Manifest download error from http://rdfepirv2am2prdstr02.blob.core.windows.net/bfd5c281a7dc4e4b84381eb0b47e3aaf/Microsoft.Compute_BGInfo_europewest_manifest.xml. Error: UnknownError. 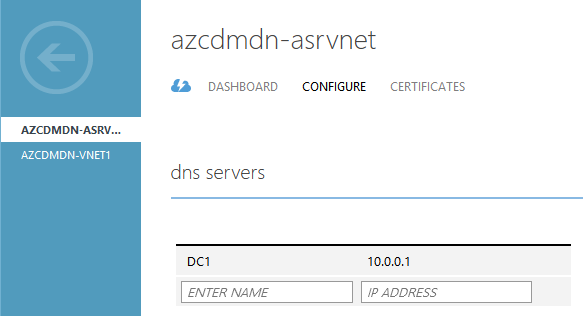 An exception occurred during a WebClient request..
That points you to your defined on-premises DNS server in the Azure Virtual Network settings. If your S2S VPN gateway connection between your on-premises and Microsoft Azure is not established the DNS server cannot be reached. You do not need to redeploy the VMs! First make sure that the gateway connection is established. Stop your VMs and start them again. During the start phase the VM tries to install the extensions and the installation will not fail because the VM can reach its DNS server. 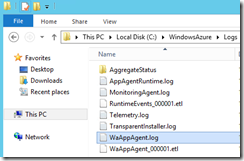 You can also check the WaAppAgent.log file again. [01/07/2015 18:53:05.78] [INFO] Plugin Microsoft.Compute.BGInfo 1.1 not found in cache. [01/07/2015 18:53:05.78] [INFO] Starting download of plugin Microsoft.Compute.BGInfo from location: http://rdfepirv2am2prdstr02.blob.core.windows.net/bfd5c281a7dc4e4b84381eb0b47e3aaf/Microsoft.Compute__BGInfo__1.1. [01/07/2015 18:53:05.83] [INFO] Download finished for plugin Microsoft.Compute.BGInfo. [01/07/2015 18:53:06.12] [INFO] Beginning installation of plugin Microsoft.Compute.BGInfo 1.1. [01/07/2015 18:53:09.63] [INFO] Successfully installed plugin Microsoft.Compute.BGInfo 1.1. 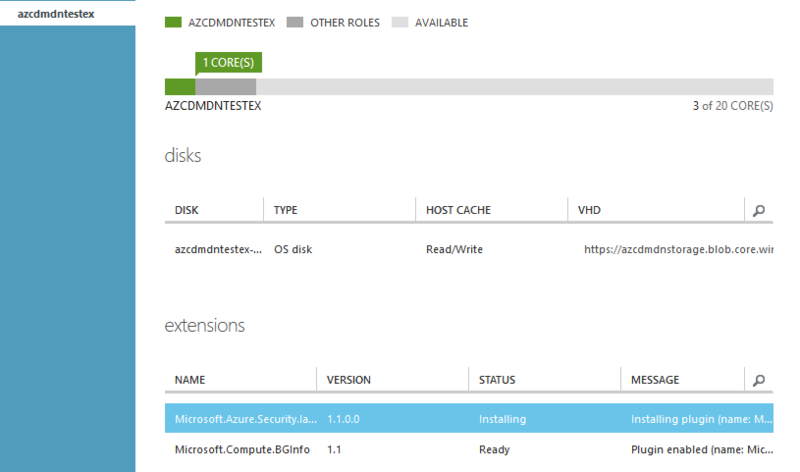 This entry was posted in Azure and tagged Cloud, Microsoft Azure, Networking, Public Cloud, Virtualization on 8. January 2015 by Daniel.